I have an avocado plant that has grown indoors since it was a pit. It grew first in a badly insulated, north-facing, wet and cool house, where it grew splendidly. 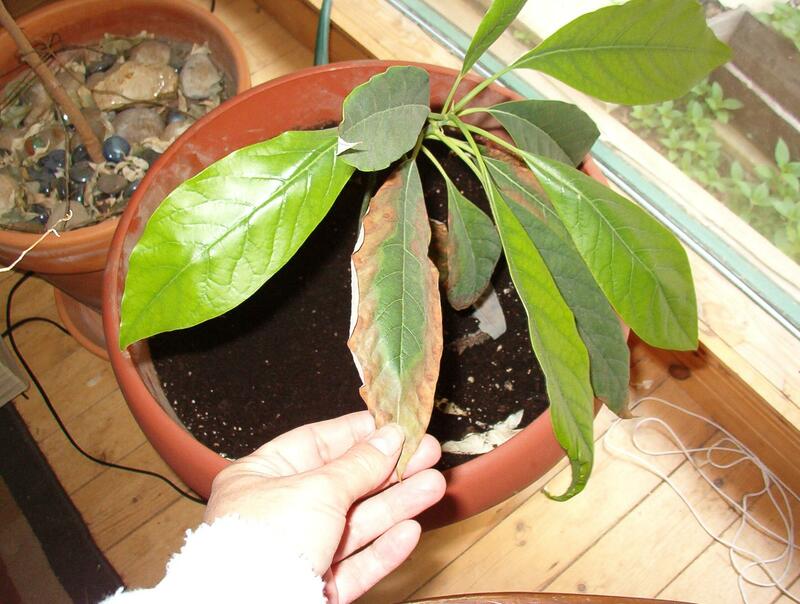 After I moved it to a well insulated house with central heating and lots of light, the avocado began to act sick. The symptoms were drying of leaves from the tip to the stalk with wavy patterns on the edge (the remaining green area, gradually reduced, would thus look like a oak leaf). I first suspected that the drying of leaves meant I had drowned the roots, so I gave it less water. Then I read somewhere the symptoms could be a fungus, the only cure for which would be some bouillie Bordelaise, which I prepared and sprayed on the plant. 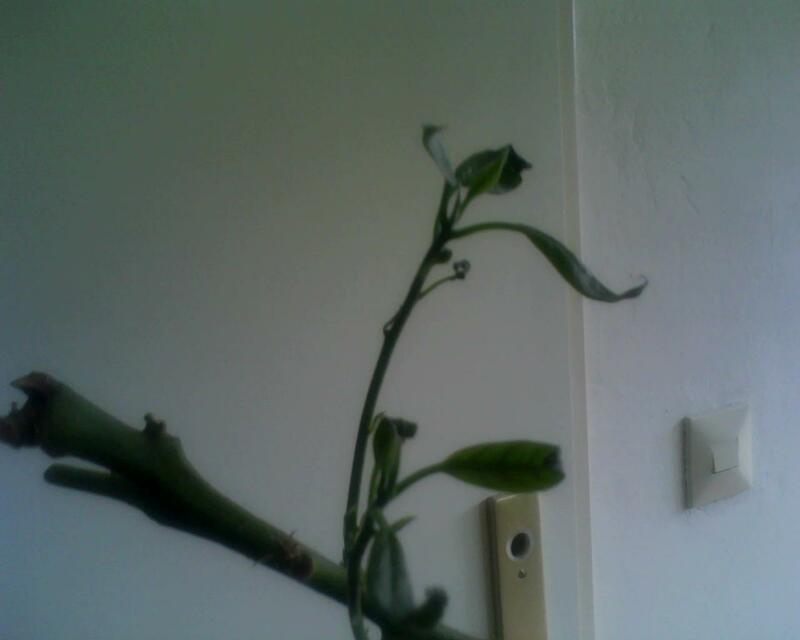 The next year the avocado grew new leaves, but by the end of summer, they got brown again. By then I thought the problem may have been the atmosphere at home, too dry perhaps. So I sprayed the avocado several times daily to keep it cool and humid. It didn't help either however. 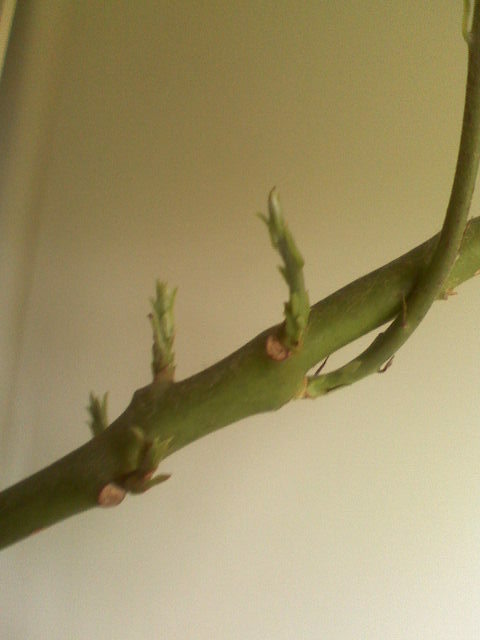 This year I pruned the tree and it grew new sprouts which dried out in turn. It didn't even get the chance to grow them. The dehydratation this year looks different however, it is not brownish, it is dark green and dry. I'm really confused, I've tried many different things and don't really know what to do now. What has caused this change? I can only think of the climate change, but funnily an avocado is a semi-tropical plant from meso-america, it should love sun and heat right? I really am attached to this tree and would like to do my best to help it grow. If you could help, I would really be happy for it. Thanks. There is another picture I found on line too. Edit July 21st, 2011: I have transplanted the large plant into a new light humus soil. I can't get a clay pot for now, so I used the same plastic pot and made 4 x 5 cm diameter holes at the bottom. Water runs through now. Hopefully that will help. 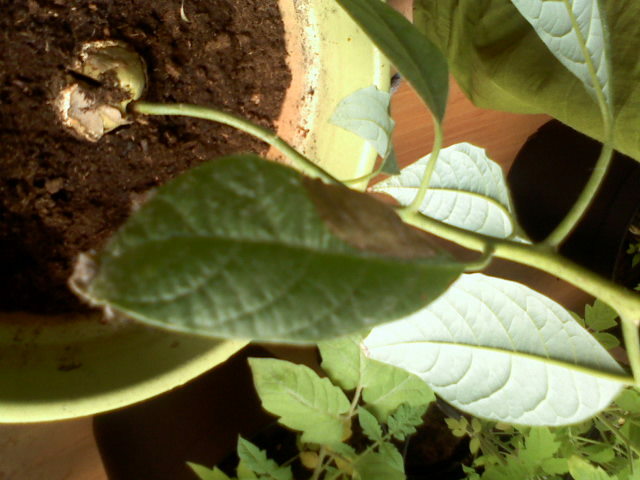 Update July 30th, 2011: I have not watered the plant a second time since changing the soil, which is still humid today. 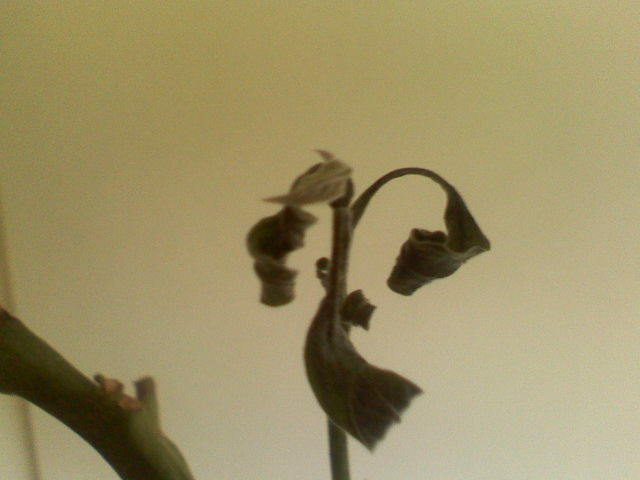 The plant's young leaves are drying out further as you can see from this picture (compare with above). There are a number or new sprouts however, but I'm afraid they'll suffer the same fate. Generally speaking (unless you are blessed with amazing outdoor soil), using soil directly from the garden isn't suitable for pots, containers, hanging-baskets, etc. It's too "heavy", doesn't contain enough air, etc. Instead get yourself a bag of "high quality" container soil mix, or create your own. Something like this, "A good general purpose container soil mix formula" would be a lot better for your containers (& plants contained within) than your garden soil. Keep in mind, no water coming out the bottom of the pot (via its drainage holes) could also be a sign you're not giving the pot (plant) enough water when you are watering. When watering, add water slowly until it starts coming out of the drainage holes in the bottom of the pot, then stop. Then wait until the water stops coming out of the drainage holes, when that happens, start again adding water slowly until you once again see water coming out of the drainage holes. The soil is now saturated and you container plant has been watered thoroughly and properly. Stick your index finger fully into the soil, when you pull it out, the very tip of that finger should feel slightly moist and have a little bit of soil stuck to it. It that occurs, you do not yet need to water that pot (plant). On the other hand, if that is not the case ie You pull out a dry and clean finger tip, it's time to water, using the method given above. If you decide to go with the above suggestions, before doing so I would take the time to carefully remove all damaged parts from the plant(s). Without seeing some clearer photos of your plant(s) it's a little difficult for me to suggest exactly what you should and shouldn't remove. Good luck and I hope the above is somewhat helpful to you. The best way to give it more humidity, is to stand it on a 'pebble tray' - fill a shallow plastic tray (one which is two or three times as wide as the base of your pot) with pebbles or grit to about 2cms below the rim, and pour water into it so that the water is just below the level of the pebbles; if you then stand your pot on the tray, and keep the tray 'topped up' with water, it will provide your avocado with a constantly humid micro-climate, which is far more effective than spraying and less trouble. an over-high night temperature - avocados are happier in a lower temperature at night. If your room temperature is more or less the same at night as during the day, I would turn down the central heating or move the plant to a cooler room. Unsuitable soil could also be a factor. Avocados will tolerate most types of soil, but prefer a light/ sandy potting compost (soil mix specially formulated for indoor plants) that is free-draining. Garden soil is definitely unsuitable for indoor plants, as it may not be sufficiently free-draining or balanced in nutrients, and also contains organisms that may thrive indoors and cause disease. There could be many reasons. I think that this plant needs a lot of things that you cannot give it inside in the conditions described. You do not say where you live. 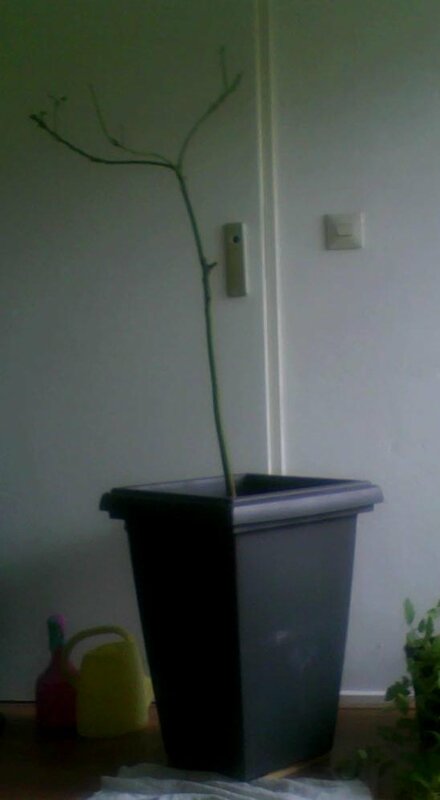 The thing that this plant needs most to thrive and survive is sufficient light, adequate water and good drainage. The best place to be is outside in a somewhat warm temperature. Inside in a window is not very natural for this plant. The leaves may be burned by sunlight magnified through the window glass. Also it must be in a container that will give plenty of room for root growth. Once it gets pot bound it will not be getting enough water. Not the answer you're looking for? Browse other questions tagged watering indoors dryness fungus avocado or ask your own question. What kind of plants will survive the heat from an air conditioner? How is an Avocado plant started? What is the best type of soil for growing an indoor avocado plant? What is this brown, shell-like thing growing on the stalk of my avocado plant? What is a recipe for a long-lasting, fast draining container soil mix with good aeration? How do I protect the roots and adjust watering levels in a non-draining indoor pot? Why are my mango tree leaves drying out before growing?